Last day of the Expo 2018! At the last day of the Expo, the company Gauksmýri was on the program. Jóhann Albertsson owns the company together with his children Albert & Hrund and his son-in-law Gunnar Páll. Gauksmýri is located right in the middle of Akureyri and Reykjavik; 194 kilometers in both directions. The people of Gauksmýri lives mainly from tourism. 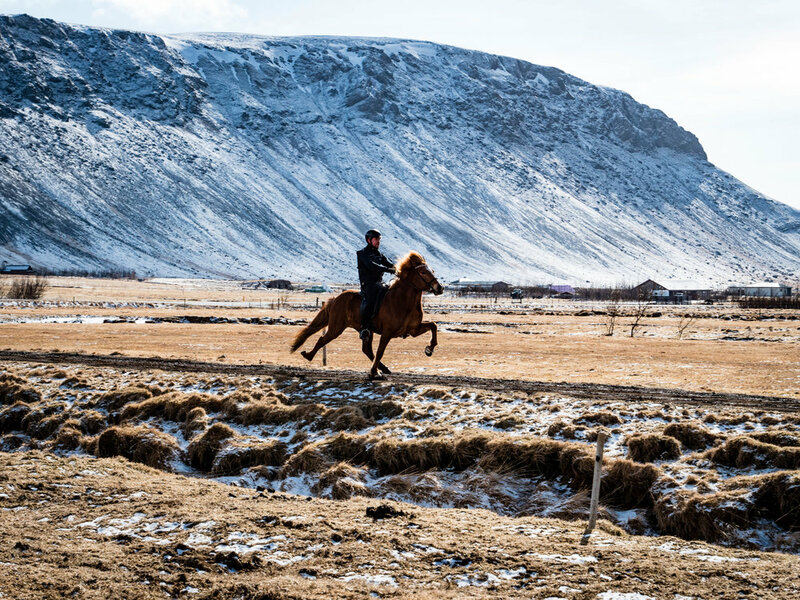 From May to October, daily shows about the history of the Icelandic horse and its gaits are presented on the oval track. The normal show lasts about an hour including a visit to the stables. For the show they use horses from their own breeding, which is why the character and the look of the horses are very important to them. Most guests combine the show with a meal in the attractively decorated restaurant. The farm has two breeding lines, one is Gauksmýri and the other is Hellnafelli, the original company of Kolla, the girlfriend of Jóhann Albertsson. All foals are born on Gauksmýri, but Kolla does not want to give up her stable name. At the farm they mainly use their own stallions, but other great stallions are also regularly used. As a special treat for the Horse Expo guests, they had brought home several young horses and mares with foals. A lot of the young horses were after their own stallion, Karri frá Gauksmýri, an Alfur frá Selfossi-son. Karri is judged with a total of 8.62 including 9 for back, tölt, trot, pace, spirit and general impression. From the Hellnafelli-line they currently use, among others, the stallion Jaðrakan, an interesting Dynur frá Hvammi-son. This was the end of another great Expo week! Thanks a lot to all the participants and all the farms, that once again gave us a very warm Icelandic welcome! 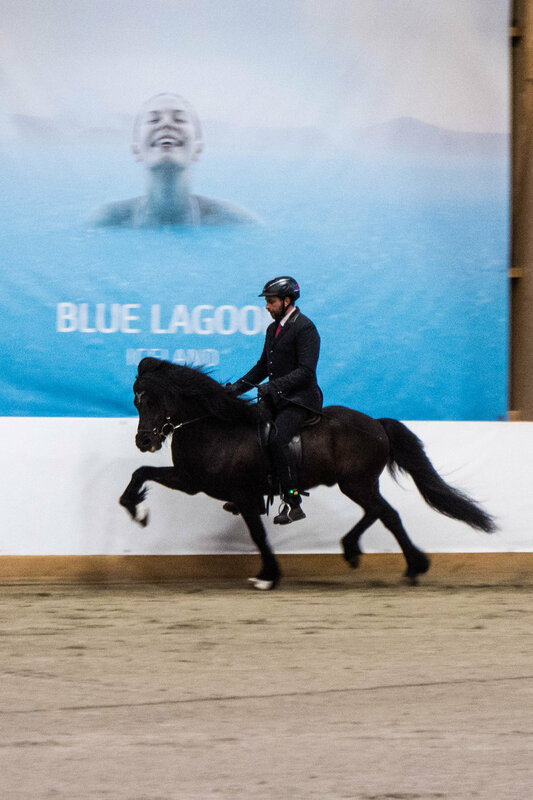 The Icelandic Horse Expo continues with the spectacular South event from 2. - 7. April 2019 - and from the 24. - 29. September 2019 you can experience the magnificent North yourself! We are looking forward to welcoming you in 2019! They were right: Laufskálarétt is really something special! Everybody was really excited for this day to come. 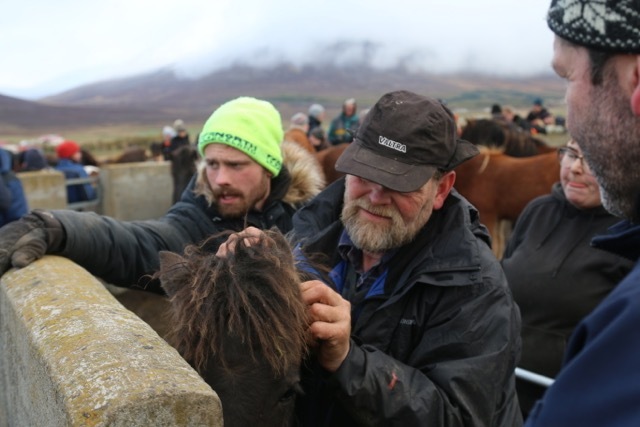 On the fourth day of the Icelandic Horse Expo we were going to the traditional Laufskálarétt where the horses are gathered in the mountains and brought to the corrals in Hjaltadal. Every year the Laufskálarétt is organized in the last weekend of September. The Laufskálarétt in Hjaltadalur is the largest and most popular in Iceland. Every year thousands of people from around the world come to see this spectacular view. Saturday morning around 500 riders leave with their horses in the mountains to drive the herd of around 600 horses to the corrals. Around noon time all riders and horses arrived back in the valley. The weather was pretty good so we saw the horses coming down the mountain long before. Last year it seemed to have been very foggy, so we were lucky! Around 3000 people from all over the world have come to experience this fantastic view. A large group of singing men, horses and the smell of dried fish give you this special Icelandic feeling. At 13.00 the selection of the more than the 600 horses started. The large round collar is divided into 12 sections. The breeder Brimnes is one of the breeders with most horses to collect. Brimnes had more than 80 horses in the mountains this summer. In groups of about 50 horses they are brought into the middle of the collar and they are sloped towards their owners. This made sorting much easier and faster. Two hours later, around three o'clock, all horses were divided. Because some horses are always changed unconsciously, the horses can only leave the collar until everyone has their own horses. Every chip on the horses were read to ensure that all horses were in the right place. Around four o'clock the horses were ready to go home. Most of them were driven home in the herd and a small part of the horses was picked up with a trailer or truck. 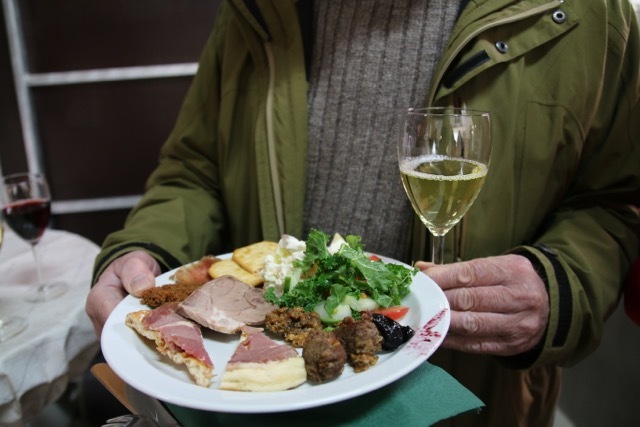 On many of the farms a party is organized and from midnight most of them gather in Varmahlíð and Sauðárkrókur to celebrate this successful day until late at night. It was fantastic to be a part of this tradition in the Northern part of Iceland. If you ever have the chance - do it! The day started with coffee and interesting talks in the stable at Miðsitja. Since 2004 the farm Miðsitja has been run by Magnús Andrésson and Ingunn Guðmundsdóttir. You properly know many of the famous horses from this farm? Like Keilir, Kveikur, Spuni, and Kraflar. And also the well known Landsmót superstar Hrannar frá Flugumýri is out of the bloodlines from Miðsitja. 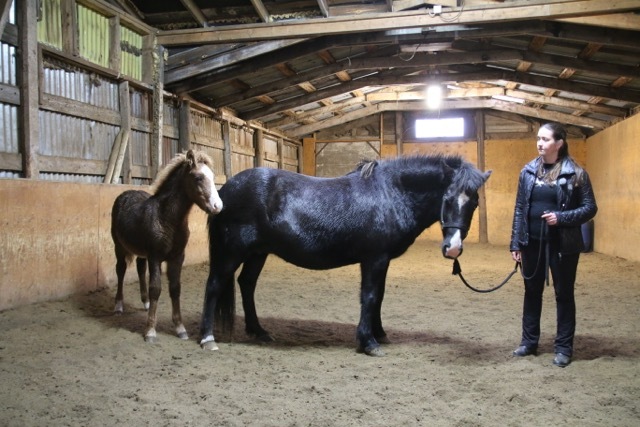 Magnús and Ingunn want to breed good five gaited horses who everyone can ride and enjoy. The last years they have therefore used stallions such as Ómur frá Kvistum, Spuni frá Vesturkoti, and Hreyfill frá Vorsabæ in their breeding. Magnús and Ingunn put a lot of effort into the training of the young horses. They start the youngsters in the riding hall but as soon as possible go outside to train in nature. They sell horses both to people in Iceland but also abroad. No matter what they like to follow the development of the horses with their new owners. We saw a lot of beautiful horses at Miðsitja and soon it was time to go on to the next farm. "Horses with movements" - this title is often associated with the farm Vatnsleysa, where Björn Jónsson and Arndís Brynjólfsdóttir live. Vatnsleysa is located between Hólar and Sauðárkrókur. 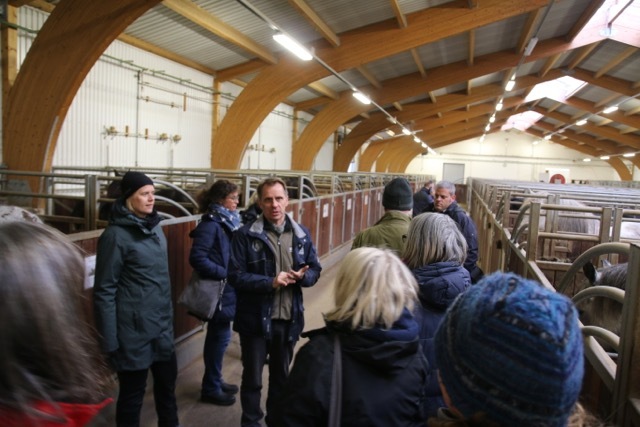 Björn and Arndís told us about the history of the breeding: The family-owned breeding begun in 1974. At that time, Bjössi's father Jón started the breeding with stallions like Lýsingur frá Voðmúlastöðum and later on he was of course very successful with his own stallions. Who doesn’t know about Glampi frá Vatnsleysu? He is still going strong, 29 years old. Today the main stallions are Hraunar, a son of Roði frá Múla and Lord, a son of Þóroddur frá Þóroddsstöðum. While Lydia and Hrund frá Vatnsleysu are their best breeding mares. In their breeding Bjössi and Arndís aim to breed horses from Vatnsleysa which are great competition horses with a nice temperament, that everyone can ride. It was so inspiring to hear Bjössi and Arndís tell about the long history and breeding from Vatnsleysa. Varmaland is the name of a very modern farm, which Sigurgeir Finnur Þorsteinsson and Birna Sigurbjörnsdóttir own. The farm is located on the way from Sauðárkrókur to Varmahlíð. At Farmland thet get 6-7 foals per year and actually the bloodlines goes back to the genes from the first farm we visited today - Miðsitja. Since 2012 Varmaland has also been a popular contact point for those who would like to have the training of their horses supported by the "AquaIcelander", a state-of-the-art horse treadmill in a water tank. Besides the treadmill there is also further wellness and rehabilitation modules from the vibration plate to the equine solarium. Especially in the winter period up to 100 horses come to use this infrastructure and to build up additional strength with this training over 2-3 weeks. 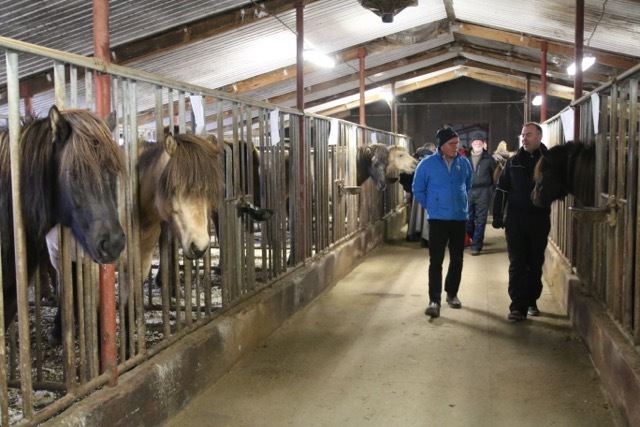 Sigurgeir and Birna also showed us some of their foals and young horses in the riding hall. They had a lot of power running free in the riding hall. We ended the day at Hafsteinsstaðir. Here Skapti Steinbjörnsson and Hildur Claessen are running the farm together with their son Skapti Ragnar and his girlfriend Elin Rós. From the farm Hafsteinsstaðir comes at least two very well known stallions: Feykir and Fáni frá Hafsteinsstöðum. They are not only very successful competition horses, but also powerful influential sires. And let's not forget Gjafar frá Hafsteinsstöðum, who has brought a large number of strong offspring from the Wiesenhof in Germany. About the breeding Skapti say: ”I want a lot of charisma”. He likes to put more emphasis on feeling than on numbers. 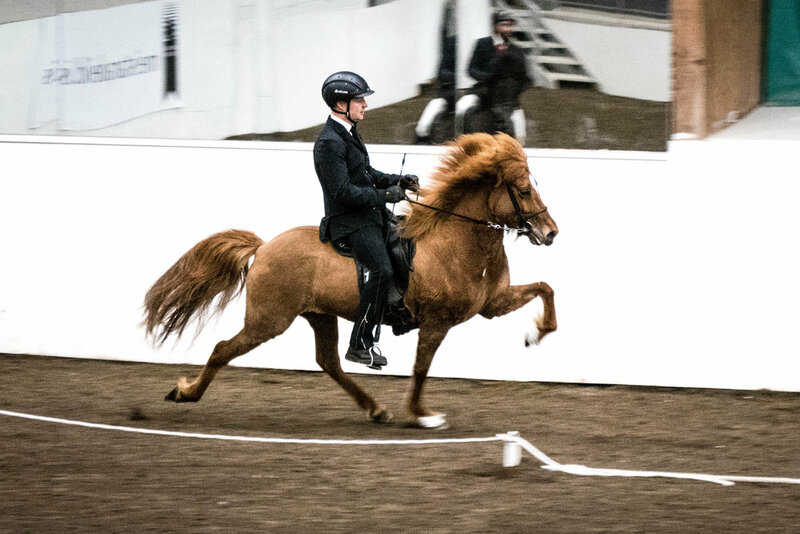 In recent years, they have quite actively used their own current superstar Oddi frá Hafsteinsstöðum - a stallion evaluated with 9.5 for tölt, trot and spirit. 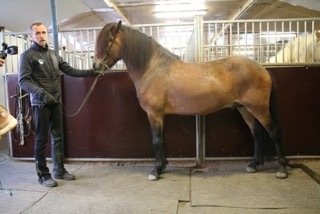 They have also used stallions like Sær frá Bakkakoti and Loki frá Selfossi. In the evening, the expo group went to the big riding hall in Sauðárkrókur - the horse scene in Skagafjörður celebrated here in a fabulous festive mood. Like every year on the evening before the Laufskálarétt. We spent the last day of the Horse Expo on two amazing farms and ended up the day at the riding club Fákur in Reykjavík and a big stallion show in the riding hall of Sprettur. First stop was on the farm Kvistir - not the Kvistir we visited the other day, but another one, where Benedikt G Benediktsson and his wife Guðrún Pálína Haraldsdóttir live. Here the horses from Stóra-Vatnsskarð are trained. 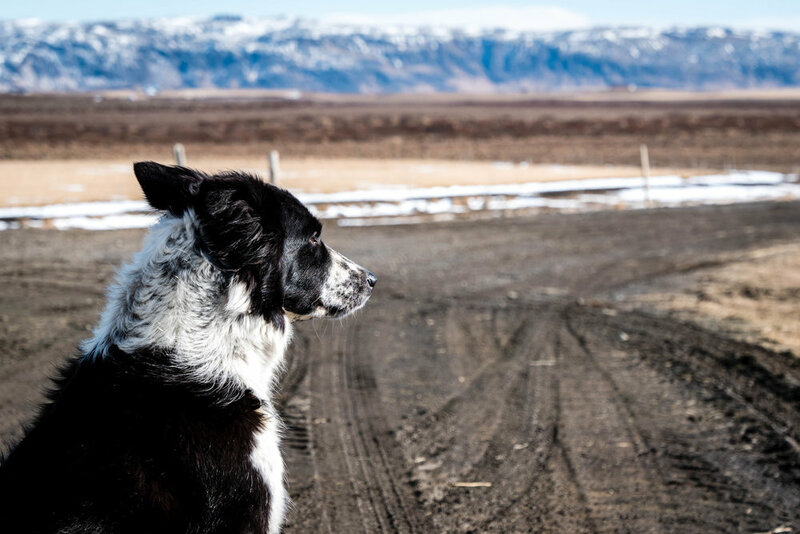 Benni is born and raised on the farm Stóra-Vatnsskarð in the northern part of Iceland. His parents still live there and the horses are growing up on the big fields nearby the farm. When the horses are ready for training they come to the Kvistir just outside Selfoss. Benni had made a tight and well organized program for us where we got to see many of his lovely horses. 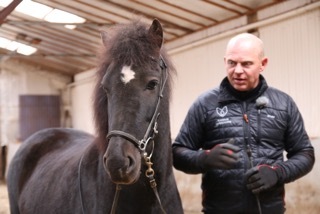 We started by checking out the breeding mares and especially one of them is very speciel to Benni — the mare Lukka frá Stóra-Vatnsskarði, the highest evaluated mare in the world. She is the mother of many great daughters and sons and they where lined up in the stable as well. Benni proudly also showed us Lukku-Láki frá Stóra-Vatnsskarði, a son of Lukka and Álfur frá Selfossi. Afterwards the trainers showed us a couple of horses under saddle and we even got a private pace showoff on the road in front of the house. We also enjoyed seeing both 2 and 3 years old horses running while standing on the fields together with all the foals from last year. And to finish the show before a chat and a coffee in the stable, Lukku-Láki showed off in beautiful trot and slow canter. He really enjoys the attention and this season he is in training at Árbakki and will be ridden by Hinrik Bragason, whom we visited the other day. It was a great pleasure to meet the family at Kvistir, enjoying horses at all ages, and to hear about the breeding of some of the best horses in the world. Just on the other side of the “highway” the next farm was located - the stunning training stable of Sunnuhvoll. Here Sigurður Sigurðsson and Anna Björg Níelsdóttir live together with their children Arnar, Glódís and Védís - and Arnar's girlfriend Árný. Arnar welcomed us in the stables and told us about the facilities and horses. The stable was build two years ago and has room for 32 horses. It is very well arranged with a riding hall in the end and from there easy to go to the oval track just outside the stable. Anna Björg started the breeding from Sunnuhvoll just 14 years old with the mare Saga frá Litlu-Sandvík and she has given the family 17 offsprings. In the breeding they focus a lot on the character of the horse so that everyone can ride the horses in the stable. Furthermore Arnar said that the conformation of the horse has to be good as well being both beautiful and functional. While having a delicious Icelandic meat soup Arnar was riding a young mare in the riding hall. 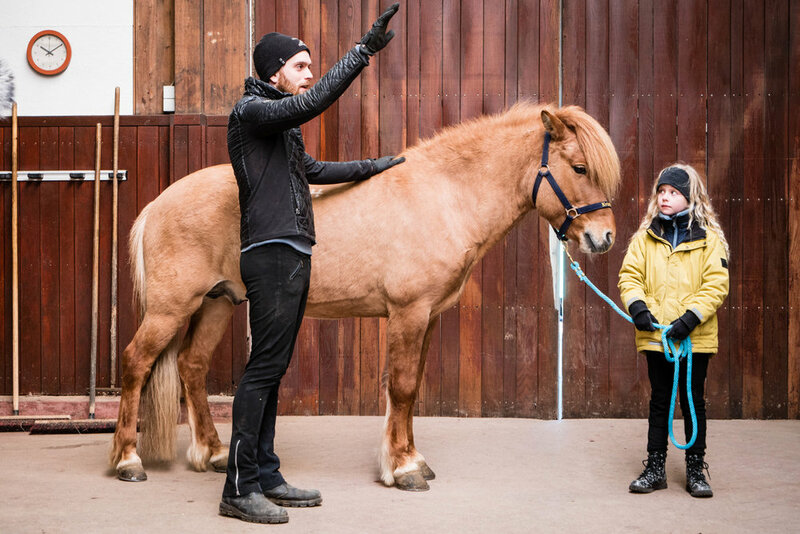 Arnar explained about his training of the horses and the importance of having the horses relaxed and aware of the rider. Arnar loves to teach and it was a great demonstration. At Sunnuhvoll they are competing a lot and it was a pleasure to see Glódís, Védís, Árný, and Arnar showing us how they train their horses inside and afterwards giving full speed on the oval track on their impressive horses. After the visit at Sunnuhvoll we were heading back to Reykjavík and the stable area of Víðidal where more than 3000 horses are stabled. 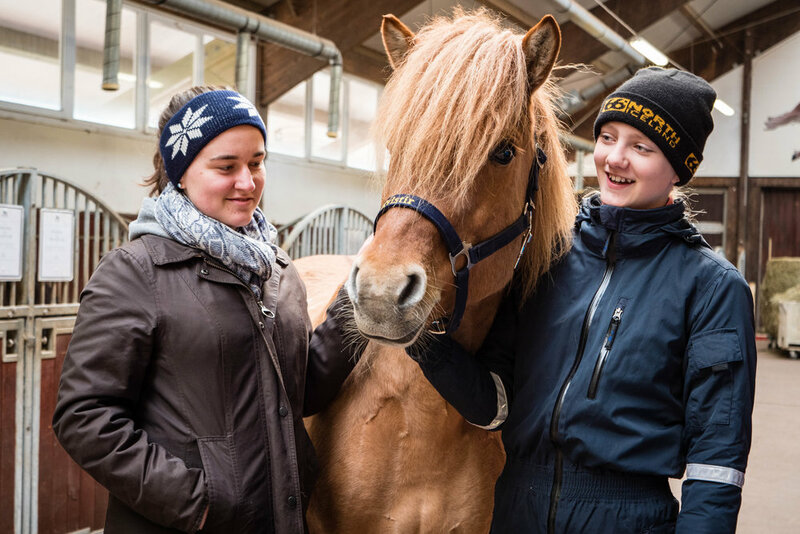 We met up with Siggi Mat and Edda Run in their stable and heard about their daily life training horses in Reykjavík. Since they were kids they have been training horses in this arena. They don’t breed so many horses themselves since they don’t have the time for it yet. During the breeding season they are instead busy with training horses for other people that are going to breeding shows and competitions. During the years they have won a lot of prizes and are often going abroad to teach and educate riders all over the world. 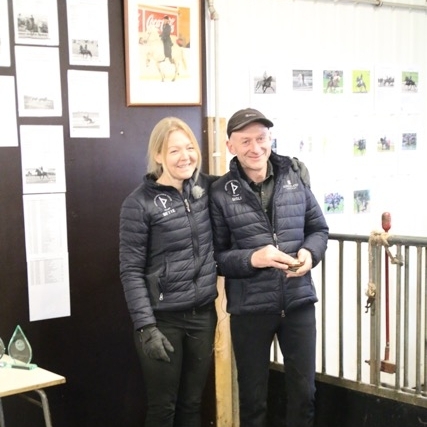 Siggi and Edda are a well known couple and are selling a lot of horses too. They really enjoy finding the perfect match between horse and rider. 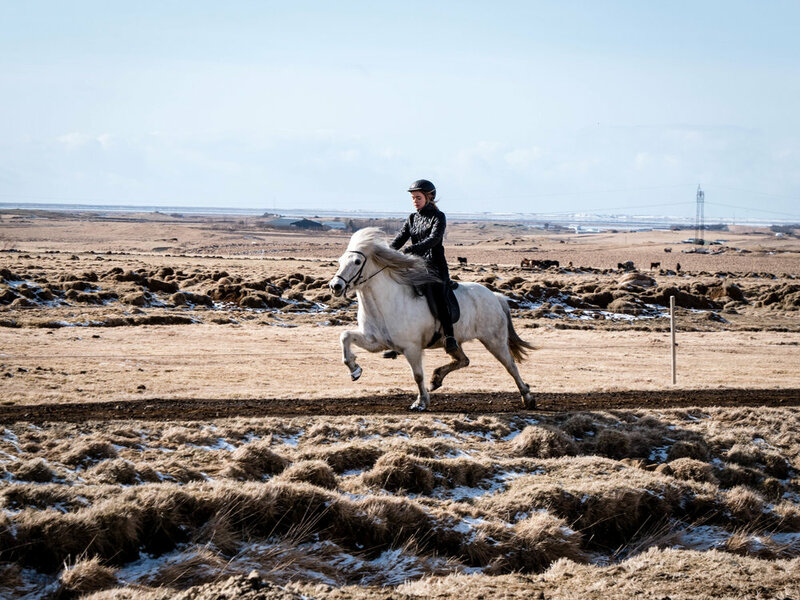 Just before leaving the riding club of Fákur we got to hear about the Landsmót taking place in Reykjavík in the beginning of July this summer. This year Fákur is hosting the event and with a special emphasis on making it a great event for the entire family. To end up the Horse Expo week in Iceland perfectly we went to the big show Stóðhestaveisla, the stallion show in Reykjavík. We enjoyed the show from the first row — it was amazing to see some of the best stallions in Iceland and the atmosphere in the area was magnificent. It’s not getting any better than this! Thank you for following the event during the week - it has been a great pleasure to keep you all updated! Tempted to join the next event? It’s really unbelievable — we have now had three days in a row with sunshine, blue sky, and almost no wind. In Iceland! It’s always fun to be with great people and see stunning horses, but it’s even better when you can also enjoy the coffee outside and take a walk on the fields to see the heard of horses. We started the day on the famous breeding farm Fet. 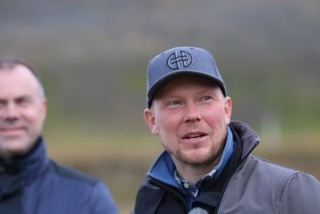 The owner of the farm is Karl Wernersson but to take care of the daily run Ólafur Andri Guðmundsson is hired as a manager. 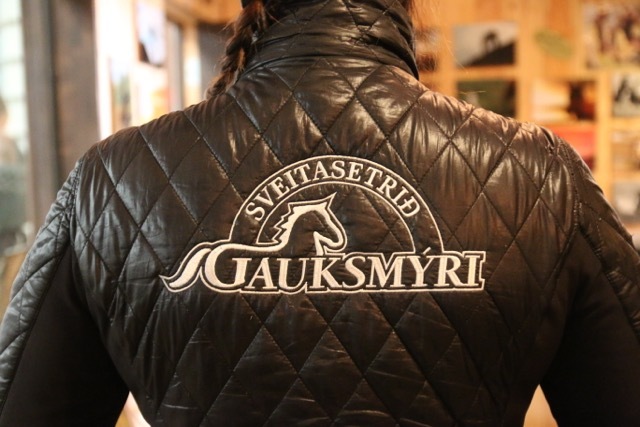 Together with his wife Bylgja Gauksdóttir and their employees they trained all the horses on Fet. Ólafur welcomed us in the stable and took us to the riding hall. Here 3 mares — all after the same mother, where lined up. Ólafur told us about the breeding lines at Fet and how many of the horses there are related to the great Orri frá Þúfu í Landeyjum. We got to see 3 more mares and a beautiful black mare running in the riding hall. Afterwards some horses were saddled and the trainers showed us how they work with their horses while Ólafur explained. They started by working from the ground as a good way to warm up the horses. Besides warming up it’s a good way to feel the mood of the horse this very day. In the daily training it’s important to get the horses to relax, being focused on the rider, and to get control of the legs of the horse. A key word from Ólafur was balance — the horse needs to be balanced both in body and mind. At Fet they are breaking in the horses in September the year they turn four years old. Ólafur himself showed us a young mare and demonstrated how he is working with the young horses and the importance of being able to speed up as well as slowing down. It was really intersting getting closer to the training methods at Fet. Inspired and excited to see more horses we went into the bus and drove to the next stop: Árbæjarhjáleiga. Here we picked up Eiríkur Vilhelm - the husband of Hekla Katharína, who took us a bit further down the road where a group of riders in orange jackets were ready to show off on the horses from Árbæjarhjáleiga. We had a great show there and the entire family - Marjolijn, Kristinn, Rakel Nathalie, and Hekla Katharína were riding the horses together with some of the trainers on the farms next to them. 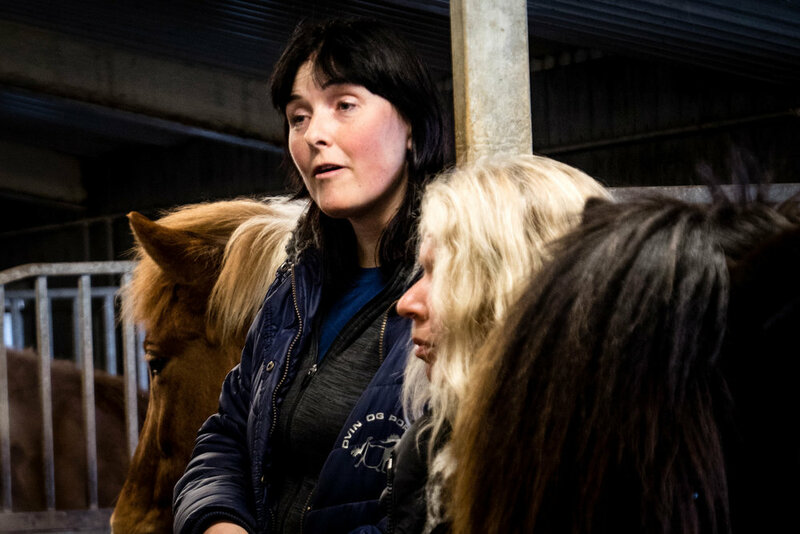 Marjolijn and Kristinn have been breeding horses for many many years and Hekla Katharína, who is now taking care of most of the daily training of the horses, told us about the farm and history. Fore example is the beautiful red stallion Jarl frá Árbæjarhjáleigu a mix of the breeding from her mother and father’s breeding before they met each other. The goal is to get Jarl in first prize for off springs — hopefully this summer at Landsmót. After the presentations we got a really nice lunch with lam from their own breeding as well. Besides horses the family have about 400 sheep, which especially Kristinn is taking care of. It was a great pleasure to meet the family at Árbæjarhjáleiga, see their powerful horses showing off in all gaits on the gravel roads and not least enjoying a cup of coffee on the slope outside the stable. You can only be a happy and positive person dealing with this view every day! Last farm visit on this third day of the Expo was Austurkot. Here Hugrún Jóhannsdóttir and Páll Bragi Hólmarsson live with their two children. We already got to meet Hugrún because she is also driving the Horse Expo bus. It was therefore also great fun to meet her in her favorite environment — in the stable among her horses. Hugrún and Páll welcomed us outside the stable with four saddled horses ready to go to the ovale track to show us some horses from their breeding. We saw a lot of good tölt, which wasn’t strange since all four horses where sired by stallions receiving 9.5 for tölt. When we came back to the stable Páll wanted to show us some of the foals. At Austurkot they get about 10 foals a year and we got to see 3 of them running in the riding hall. Hugrún told us that they sell quite many horses and that the horses for sale are actually the good ones — they aren’t sold because they aren’t good, but because they are good! That’s really a good way to look at it and when selling a good horse it’s possible to fulfil some of your dreams — for instance buying a farm like Hugrún said. We also got to see a beautiful red stallion, Sjáfur frá Austurkoti. He moved around in the riding hall with big and supple movements. Unfortunately he is injured and can’t be used for riding any more. Instead they keep him as a stallion for breeding because he is a really good four gaited stallion with the AC-gene, which makes him interesting as a breeding horse. 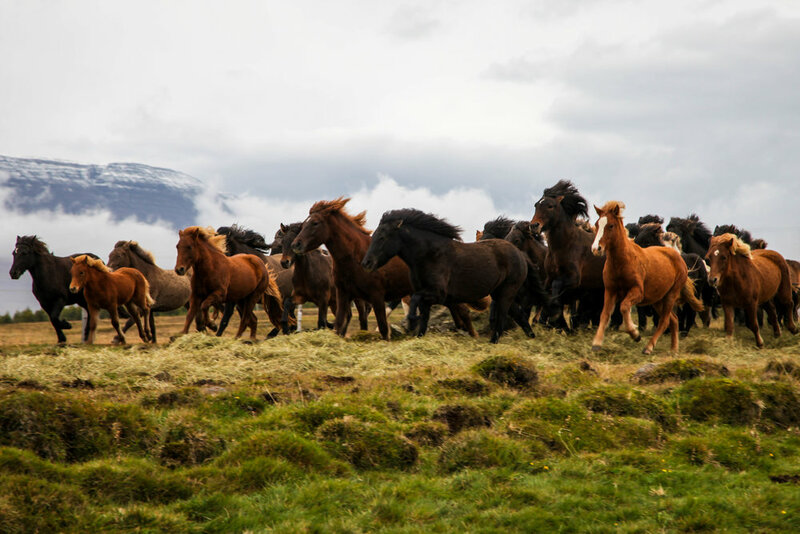 To keep the Icelandic horse breed both four gaited and five gaited new study shows the importance of the combination of genes when it comes to gaits. Many people are aiming for the AA-gene which include pace, but to Hugrún and Páll it’s important to keep breeding horses without the gene for pace as well. We had a great stay at Austurkot and it was a pleasure to see all the horses proudly being presented for us. After the farm visits we had a short time in the guest house and hotel to change clothes before moving on in today’s program: Next up, the final night of the Meistaradeildin where the best riders in Iceland are competing in T1 and speedpace! Now we are ready for a great final day of the Expo! SEE SOME OF THE HIGH LIGHTS FROM THE SECOND DAY OF THE EXPO HERE! Yet another great day in the southern part of Iceland is over! We started the day at the farm Kvistir just outside Hella. The farm in own by the German man Günther Weber but run by Sigvaldi L. Gudmundsson, who lives there with his wife Marta Gunnarsdóttir and their two children Elísabet Líf and Helgi Hrafn. In 1998 Günther build up the entire place and even brought the materials from Germany. Kvistir has been run as a top professional training stable since and many really good competition horses have the name “frá Kvistum”. Fore example Muni frá Kvistum, Óliver frá Kvistum and not least Ómur frá Kvistum. As Sigvaldi said: “Home of the champions”. 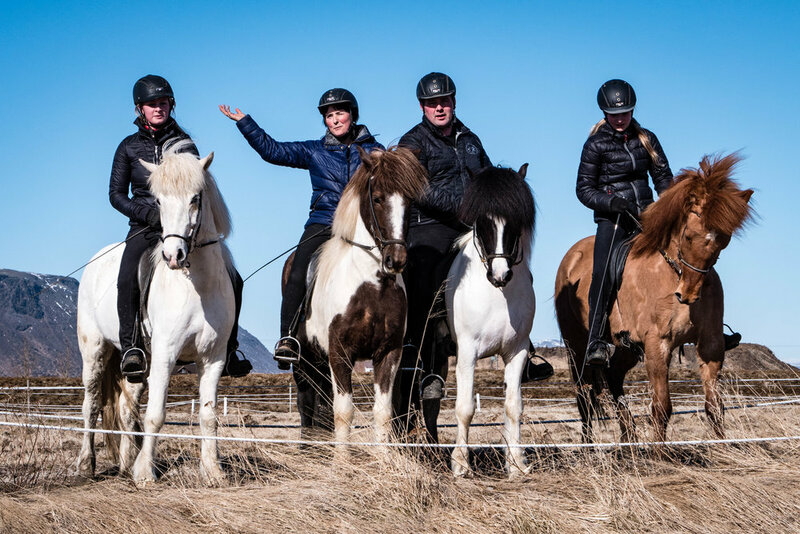 After having coffee and Icelandic sweets and cake both Sigvaldi and Elísabet showed us how they train the horses and demonstrated how good it is for the young riders to have a horse they can trust and have fun with. Elísabet is 9 years old and just started to compete on the black mare María. Furthermore, we had the pleasure of seeing a young Ómur-son who made an enthusiastic show for os running free in the riding hall. We ended the visit at Kvistir by seeing the great Ómur showing off with Sigvaldi in the saddle on the roads near by the farm. Petra drove the bus further into the country. Next stop was Friðheimar where Knútur and Helena live. The don’t just breed horses, they are also growing a whole lot of tomatoes. Actually they grow so many tomatoes that they are selling to the super markeds and are running a really good restaurant with all kind of dishes with tomatoes. And the delicious food is served in the middle of the big green houses. 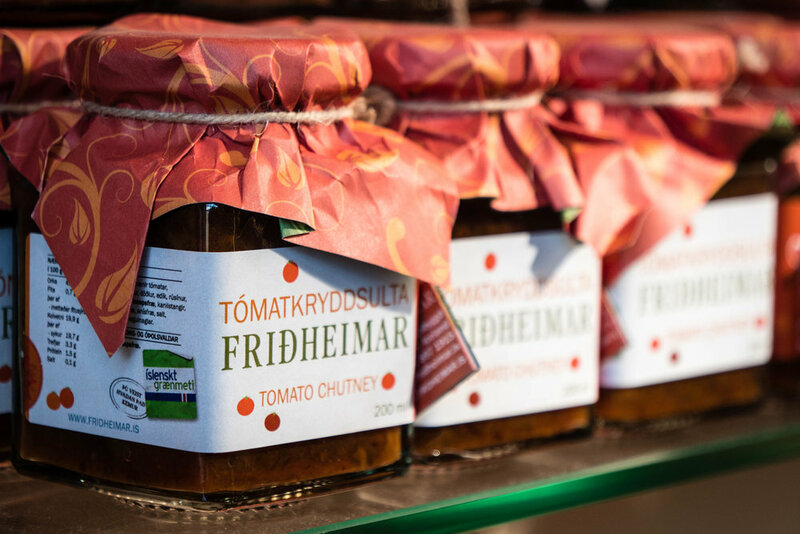 At Friðheimar, the principle has been to grow tomatoes with optimum taste quality, while maintaining eco-friendly standards. The tomatoes are now grown all year, using state-of-the-art technology in an environmentally-friendly way. Green energy, pure water and biological pest controls make for tasty and healthful tomatoes. After the ultimate tomato experience we went to see the stable and the horses there. 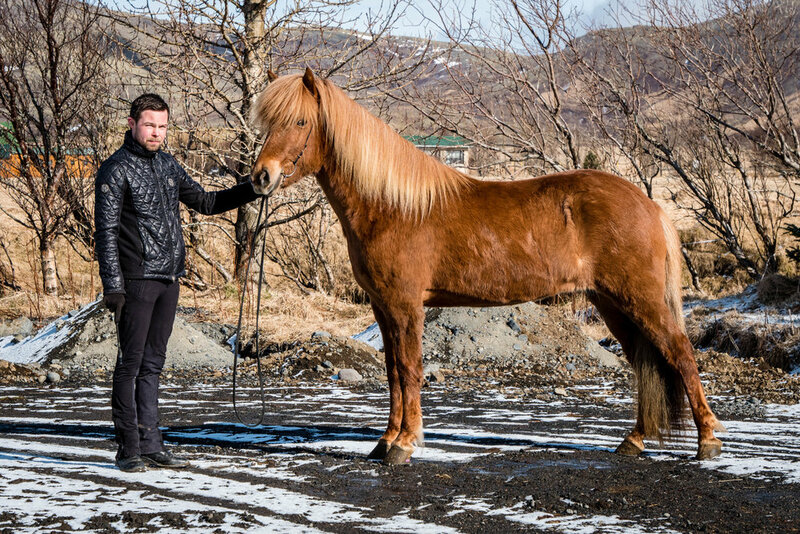 Knútur has been training horses since he was a child and are still breeding 1-3 foals a year. During the summer time guests can enjoy the popular horse show at Friðheimar and get to know more about the Icelandic horse breed. Third and last farm of the day was Þóroddsstaðir. On Þóroddsstaðir Bjarni and Margrétar have been breeding horses for many many years. The goal is to fulfill the dream about well–shaped horses with great riding abilities. Bjarni put emphasis on the importance of the mares in the breeding: That it is very important to have good mares to succes in breeding. Today they only use first prize mares on Þóroddsstaðir. So to Bjarni quality comes definitely before quantity. And Bjarni — the son of Bjarni, afterwards showed us two horses to talk about the conformation of the horses and then showed us a beautiful black stallion in all five gaits on the gravel road. To end the day on the farms perfectly Bjarni’s grandson Hrói rode his white mare Spöng frá Þóroddsstöðum. Hrói is 5 years old and Spöng 20 years old! After the farm visits we went to the shop Baldvin & Þorvaldur where we had the chance to buy some riding gear and chat before going to the Breeders Night. We had a great dinner and got to talk with all the breeders we have been and will be visiting the next days. 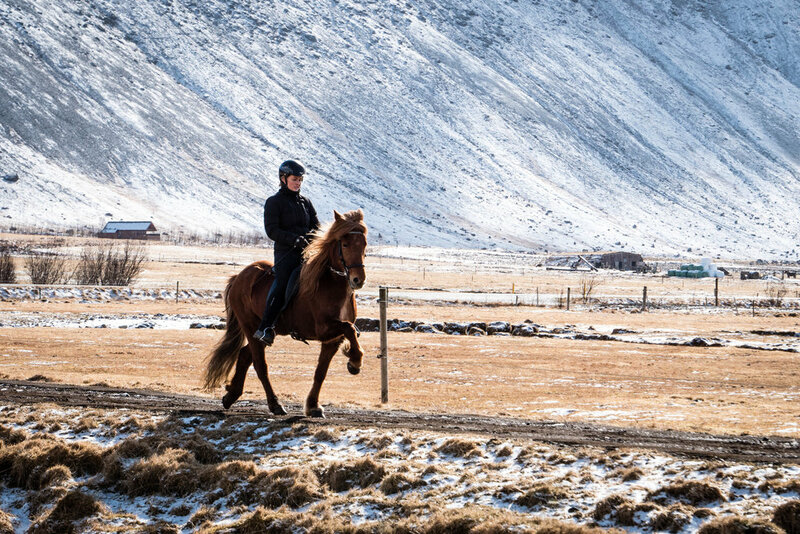 Tomorrow we are ready for even more Icelandic horse power and sunshine! We started the day at the farm Halakot where Svanhvít Kristjánsdóttir lives and trains her horses. Most Icelandic horse people knew her husband, the great horse man Einar Öder, who sadly passed away a few years ago. Svanhvít continues the ambitious breeding, but the world champion Glóðafeykir frá Halakoti is an excellent example of their good horses. The barn at Halakot is beautifully shaped with six corners and the boxes placed in a circle around the middle. The ground in the middle is used for lounging, work from hand, and as a small indoor working and relaxing spot in bad weather. Today the weather was amazing and the sun shining. Svanhvít showed us two powerful horses on the road between the fields. First the beautiful Bay stallion Ötull frá Halakoti sired by Herjólfur frá Ragnheidarstöðum and then a daughter of Hnokki fra Fellskoti, Hraunglóð frá Halakoti. Both horses are out of the mare Glóð frá Grjóteyri. We had a great first visit to Halakot and the bus then took us further into the country — next stop Árbakki/Hestvit. At Árbakki Hinrik Bragason and Hulda Gústafsdóttir run their business. Besides training horses they also export a lot of horses from Iceland. Actually they were the biggest exporting company in 2016 and 2017. Hulda was waiting for us in the door and Hinrik was about to saddle the first horse to show us when we arrived to the farm. Hulda and Hinrik are competing a lot and many well known horses have been trained and are trained at Árbakki. 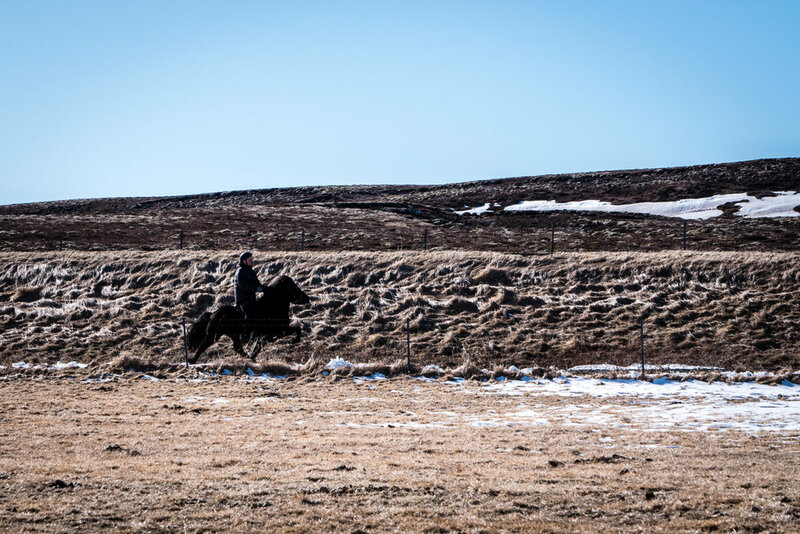 While Hinrik showed us the daily training of two horses - Hrokur frá Hjardartuni and Nutið frá Koltursey, Hulda told us about their horses, the breeding, and how they train the horses. She told about the character of the horse; why it is so important that the horses have a great temper and are fast learners. Big movements and strength are not worth something if the character of the horse is not good. After the presentations of the horses in the riding hall, we had a great lunch in the coffee room. On the walls all the trophies were standing one by one — you didn't really doubt that here live top motivated competitive people. We also got to see a beautiful bay stallion running in the riding hall. He was a good example of a horse with a great temper, but also a powerful mind and with elastic and big movements. He was really something special — Arður frá Efri-Þverá. Last stop on this first day of the Icelandic Horse Expo Spring-South was on the farm Strandarhöfð. The farm is owned by Guðmundur Már Stefansson and Auður M. Möller, but Ásmundur Ernir Snorrason and his girlfriend Stella Sólveig Pálmarsdóttir are running the stable together with their employe Matthías Elmar Tómasson. The farm was renovated in 2009 and is now a top professional training stable with space for almost 40 horses in training and a riding hall. Ásmundur started by going through all the horses and told us about their age, bloodlines, and state of training. Afterwards we got to see a young stallion, Ás frá Strandarhöfði, a son of Lukku-Láki Frá Stóra-Vatnsskarði, running in the ridning hall. Ásmundur really likes this young stallion and was excited himself to see him run in the hall without rider. The movements were really light and the horse ran easily around with a beautifully arched neck. Afterwards Ásmundur was riding the stallion Dökkvi, which is one of Stella’s favorites in the stable. A really good four gaited stallion. Before seeing more horses under rider, there was a lottery. 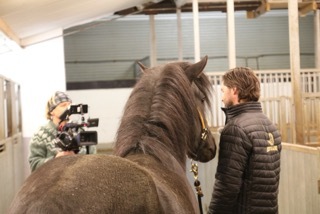 And the lucky winner could choose a coverage under one of the stallions from Strandarhöfð! What a prize, and the winner was really excited and now just need to find a good mare as well. To end a perfect Expo day, Ásmundur and Stella showed us two powerful horses on the road in front of the stable. It was a fantastic view in the sun, with a bit of snow on the ground, and the magic Icelandic landscape in the background. We are looking forward to another great Expo day tomorrow filled with interesting talks, blue sky, and passion for the Icelandic horse! 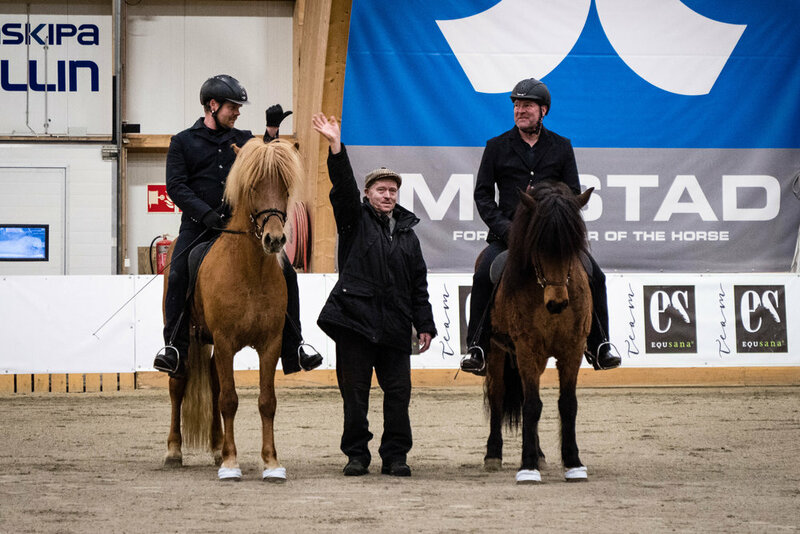 Welcome to the Icelandic Horse Expo Spring-South 2018! A bus full of excited Icelandic horse lovers just arrived in Selfoss tonight. Together we had a great welcome by the Expo team at the bar Krían where we got Icelandic meat soup and the chance to get to know each other a little bit better. 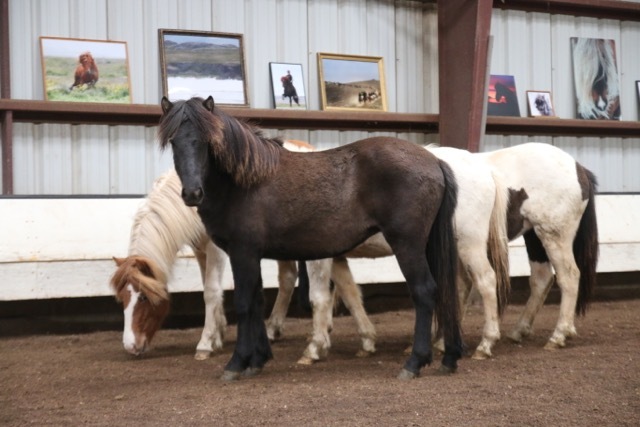 During the next four days we are going to learn a lot more about how they breed, train, and educate horses on some of the most well known horse farms in the south of Iceland. We also get to enjoy some of the biggest horse shows in Iceland - Meistaradeildin on Friday night and Stóðhestaveisla Saturday night. Everyone is excited about the days to come and The Icelandic Horse Expo started out with a beautiful sunset and some young horses enjoying life on the big fields just outside Selfoss. READY, SET, GO - HERE WE COME! 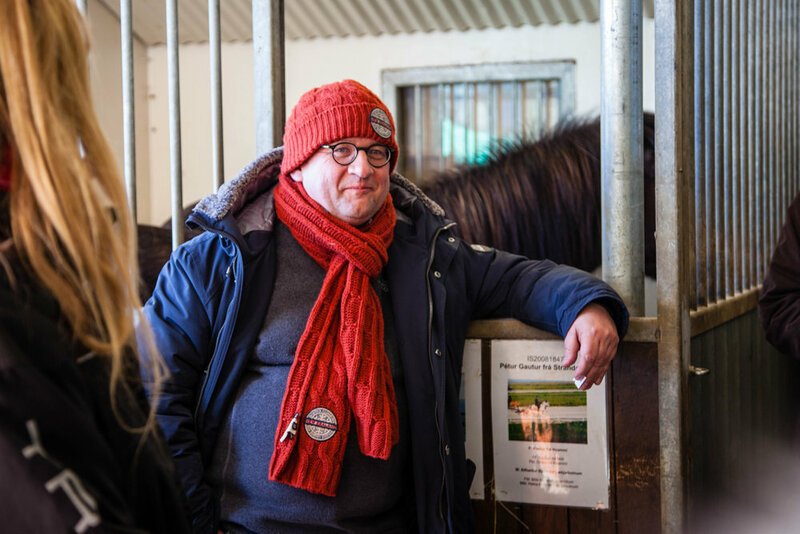 One bus, more than 35 people with a passion for the Icelandic horse, great weather and good mood – that´s the perfect combination when going south for the Icelandic Horse Expo Spring 2018. 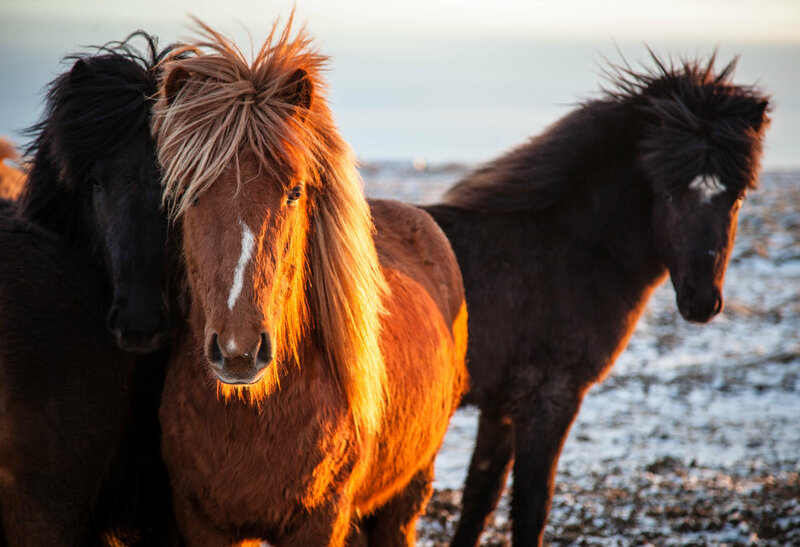 What is the Icelandic Horse Expo? 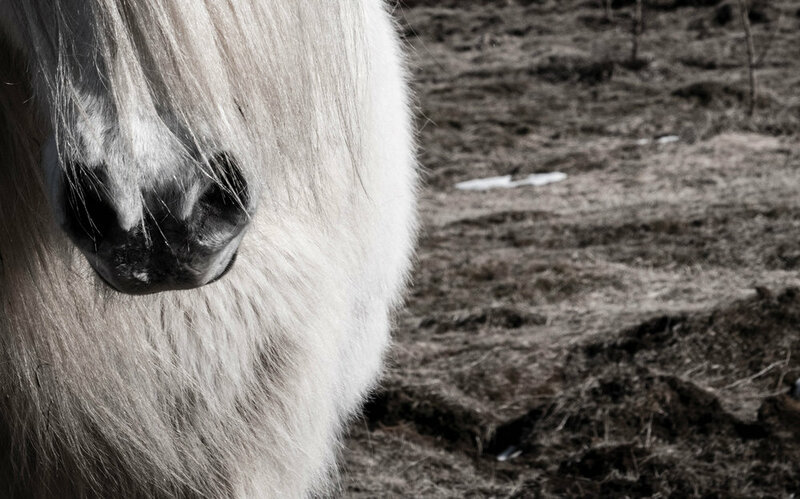 Our concept is very simple: we want to help connect people who share a great passion for the Icelandic horse and invite them to come together where it all began. It is here in Iceland that we will visit some of the best breeding farms of the country, experience an amazing program with delicious food and fantastic shows. 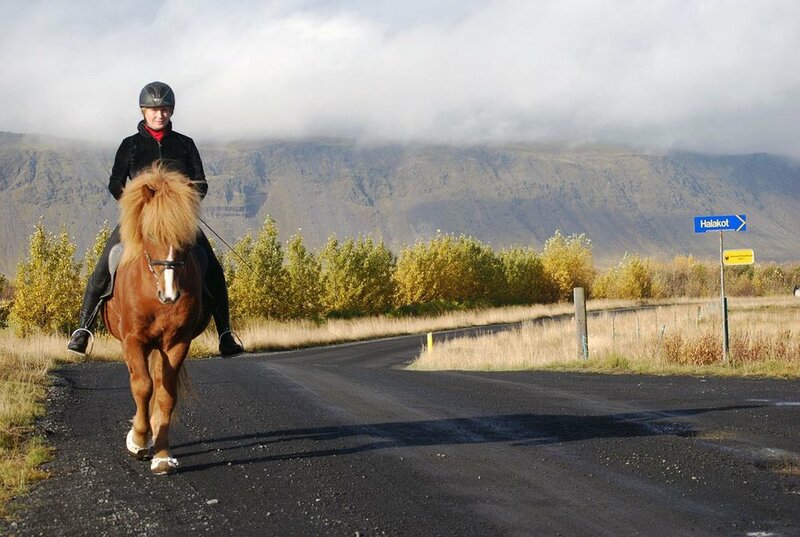 The main thing is to meet fellow horse lovers and help build an even better international Icelandic Horse community. During the next five days we will be uploading articles and beautiful photos here on www.icelandichorseexpo.com and Facebook. 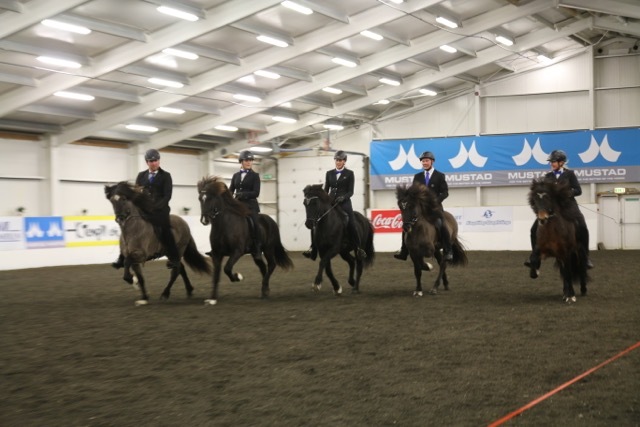 The Icelandic Horse Expo is neither a sales show nor an exhibition. 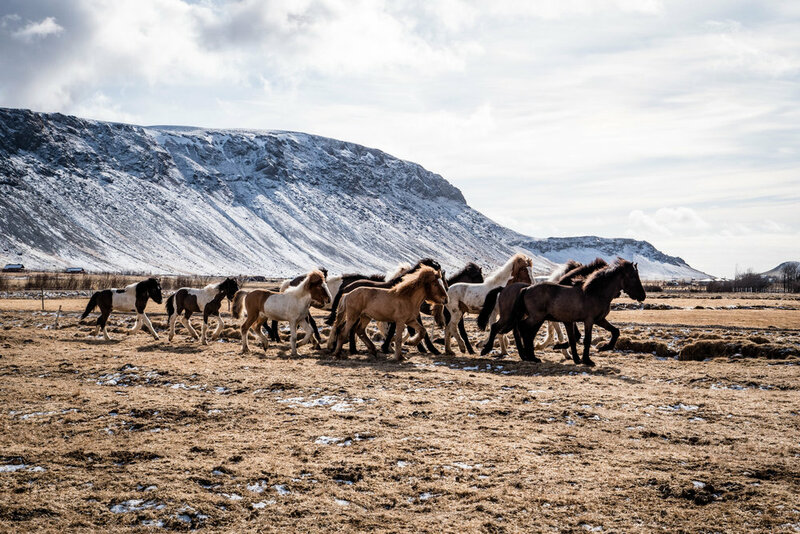 It is rather an opportunity for horse lovers from outside Iceland to come and experience the Icelandic horse in its natural surroundings, to build bridges and friendships across countries. On our way around South Iceland we will also get to know Knutur and Helena at Friðheimar better. "Friðheimar is a greenhouse and a horse breeding farm. It's an open farm were we welcome 160.000 guests every year to visit our stable and greenhouse where we also have a restaurant. 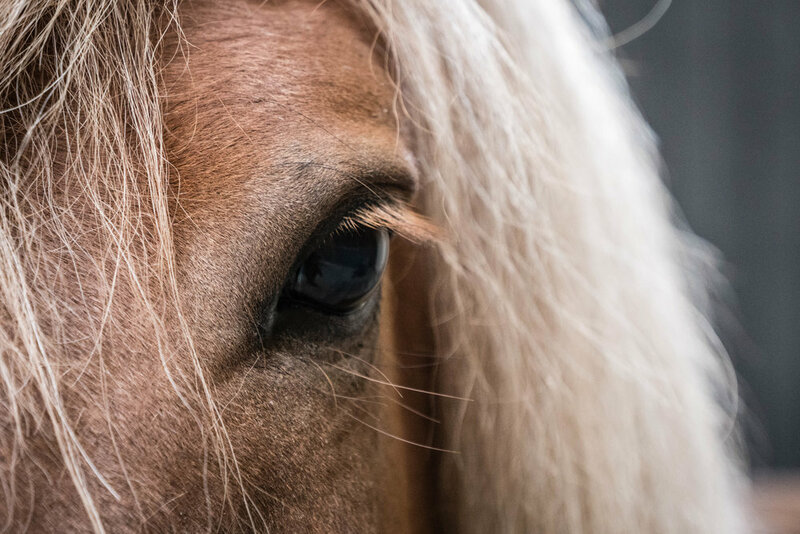 During the summer months, Friðheimar offers its own horse show: A Meeting with the Icelandic Horse, available in fourteen different languages, with an accompaniment of lively Icelandic music. And all year around we also offer a visit to our stable were we tell about the Icelandic horse and show one horse in all 5 gaits. We have build up our farm since 1995 when we bought it. Knutur Armann finished Hólar in 1994 and Helena the horticulture in Gardyrkjuskólinn Hveragerdi also in 1994. Horses have been bred at Friðheimar since 1995, 8 horses have been shown at breeding evaluations, of which 4 received first prize – an overall score of 8.0 or higher. The stud is now raising some very promising colts – and our mares are only bred with prize-winning stallions. Horse breeding is a long-term business, but now each year two or three promising youngsters are ready to start training. Friðheimar owns a total of about forty five horses. 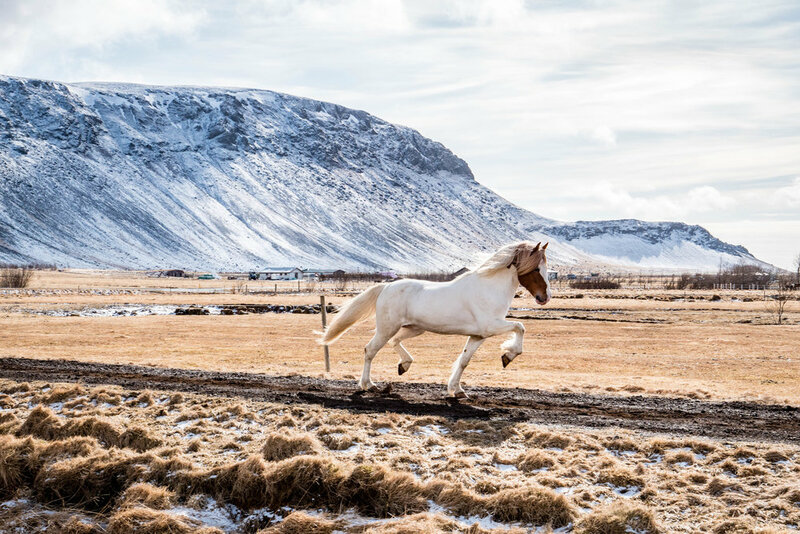 Ever since we started breeding horses at Friðheimar in 1995, our aim has been to breed willing, good-looking individuals with good neck and shoulders and a good disposition. We place a lot of emphasis on good tölt, high graceful leg action and style, preferably five-gaiters, or good riding horses with extended gaits and speed. Stallions from various bloodlines are bred with the mares, and we make sure to select an outstanding stud to cover each mare." 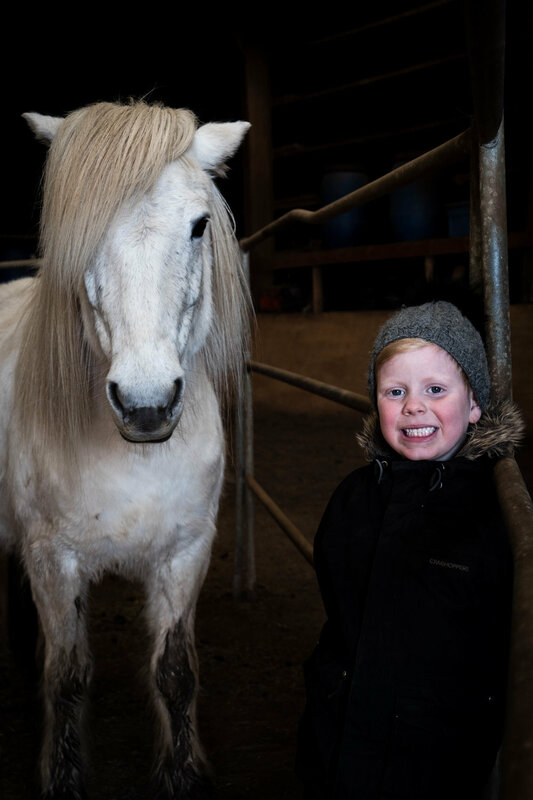 Many people in Iceland are growing up with the horses as a natural part of their life. The children go horseback riding even before they walk and later on they help with the daily run of the farm - and some might even take over the business. Árbæjarhjáleiga is located in the south of Iceland - close to the town Hella. Marjolijn and Kristinn have owned the farm and lived here with their two daughters Hekla Katharína and Rakel Nathalie since 1992. In 2017 Hekla Katharína and her husband Eiríkur Vilhelm began to run the stable. 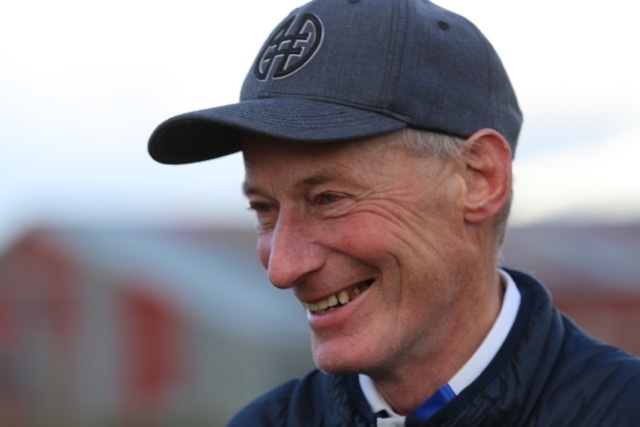 About the breeding at Árbæjarhjáleiga Hekla Katharína tells: “We have had good luck with some truly great horses from our farm. The highest judged is Jarl frá Árbæjarhjáleigu, IS2007, which has a total of 8.78 in the breeding assessment. 8.50 for conformation and 8.96 for ridden abilities. Jarl offspring’s have a lot af character, good gaits and there is always something special about them, some extra charisma. Already some have been shown in breeding assessments. Þökk frá Árbæjarhjáleigu was the highest judged 4year old in 2015. In 2016 Eldey frá Árbæjarhjáleigu was shown and has 7.97. Last year Fura frá Árbæjarhjáleigu was shown 4-year-old and scored 8.12 in total. Two stallions went for breeding assessment also and both got 1.st. price. We know that many of Jarl’s offspring’s are heading for breeding assessment this summer and hopefully they will also be shown at Landsmót hestamanna in Reykjavík. Our breeding line is strongly connected to the great Ófeigur frá Flugumýri. Five of our breeding mares are his daughters. The qualities that we like so much from Ófeigur are the strong characters with a lot of movement and a great willingness. We would say that we breed our horses with the goal of having horses with a good character, charismatic looks, big movements and five good gaits with a big emphasis on good and clear beated tölt. We focus a lot on certain qualities in our breeding - I would say we go a lot by feeling. What feeling does the stallion or mare give you when you see it or ride it. We try to use our instinct. The whole family are looking forward to welcome this year’s Horse Expo guests. We are really excited. Jarl will be showed as well as his off springs. We have a lot of new talents in the stable which will hopefully show their best. We are really looking forward to welcome Horse Expo at Árbæjarhjáleiga and show the fruit of our breeding." The photos below show Fura frá Árbæjarhjáleigu (four years old) and Hekla Katharína Kristinsdóttir, Þökk, and Jarl. The Icelanders are warm and welcoming and the atmosphere on the farms are great. And the farm Kvistir is no exception - we guarantee that this visit will put a smile on your face. Kvistir is a horse breeding farm located in the South of Iceland, little more than 1 hour drive from Reykjavik, close to town Hella. 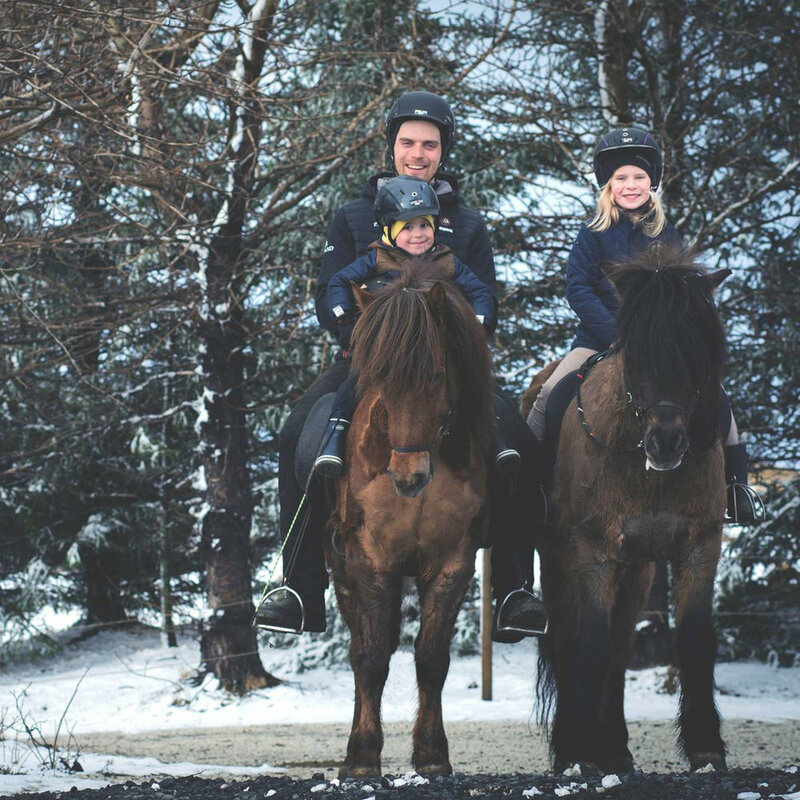 Kvistir is owned by Günther Weber and run by riding instructor and trainer Sigvaldi L. Gudmundsson, who lives there with his wife Marta Gunnarsdóttir and their two children Elísabet Líf and Helgi Hrafn. 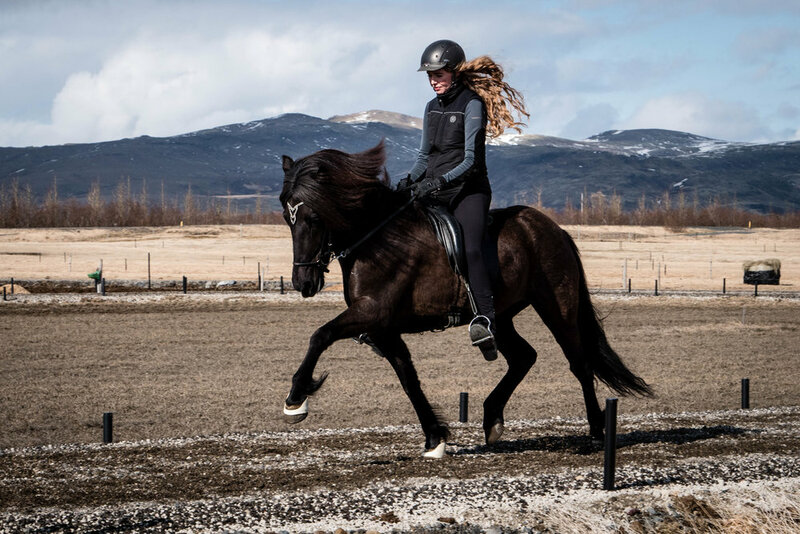 Sigvaldi started working at Kvistir in January 2016 after working as a riding instructor at Hólar University and later at the Agricultural University of Iceland. "Kvistir is known to have bred great horses that have been successful in competition. Horses such as Oliver, Fannar and Muni frá Kvistum, which we have seen on the oval track at the World Championships, achieving great success. Also, we should mention the mare, Skíma frá Kvistum who attracted a lot of attention with her rider Árni Björn Pálsson. One of our greatest breeding achievements is Ómur frá Kvistum. A stallion that has shown his excellence both in the breeding evaluation, where he reached the outstanding score of 9.5 both for pace and spirit, and also in competition where he showed his outstanding capabilities winning the A Class at LM 2011 with the rider Hinrik Bragason. He has been popular as a breeding stallion and his offsprings are attracting a lot of attention. 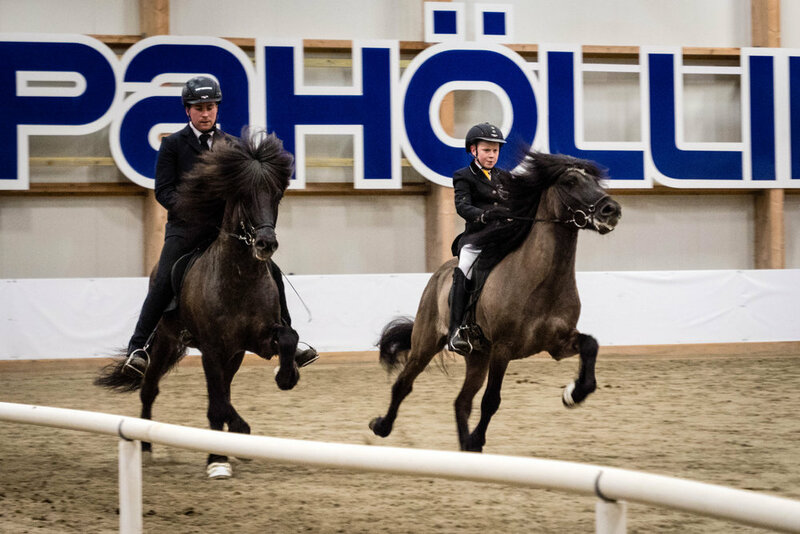 At the 2014 LM held in Hella, we witnessed his son Konsert frá Hofi winning the 4-year-old stallions class with 8.72 – the highest score in the world in this class that year. There are many other offspring of Ómur that have already proven themselves, and we know that there are many more good results to come! The goal here at Kvistir is to produce quality horses. We get 8-10 foals a year from 1st prize mares and every year we choose stallions we believe can give offspring that will attract attention both in beauty and talent. We strive for well built horses with high leg movements, great gaits and outstanding spirit who can suit both in competition and for pleasure riding. 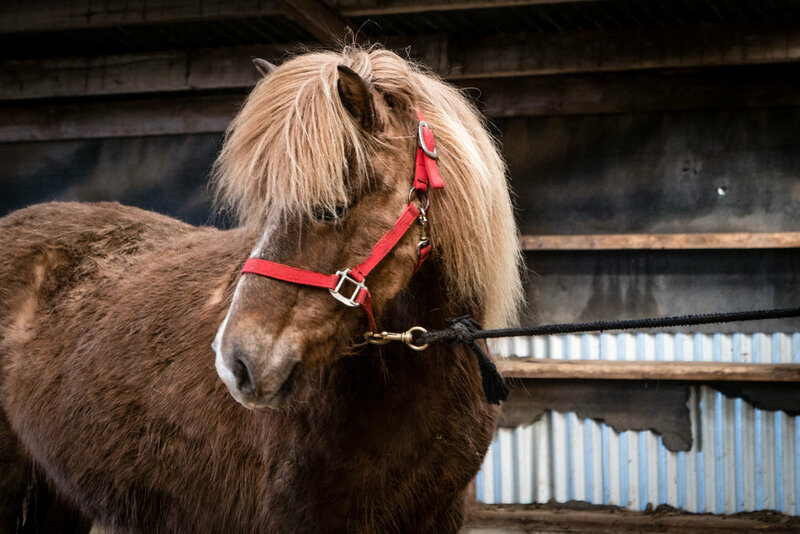 We wish to give the Horse Expo visitors an insight to the Icelandic Horse by welcoming them to our stable and allowing them to have an up-close and personal look at our breeding, showing them our horses of all ages and give them a special opportunity to meet our big star, Ómur. And of course it is our hope that they will enjoy our company and lovely horses and have a pleasant experience at the farm." "At Halakot you will find the fantastic history of the Icelandic horse and the inspiration in meeting your future friend and horse. Here you will find beautiful talented horses with strong over-line that carry themselves well, have good proportion and stable mentality. 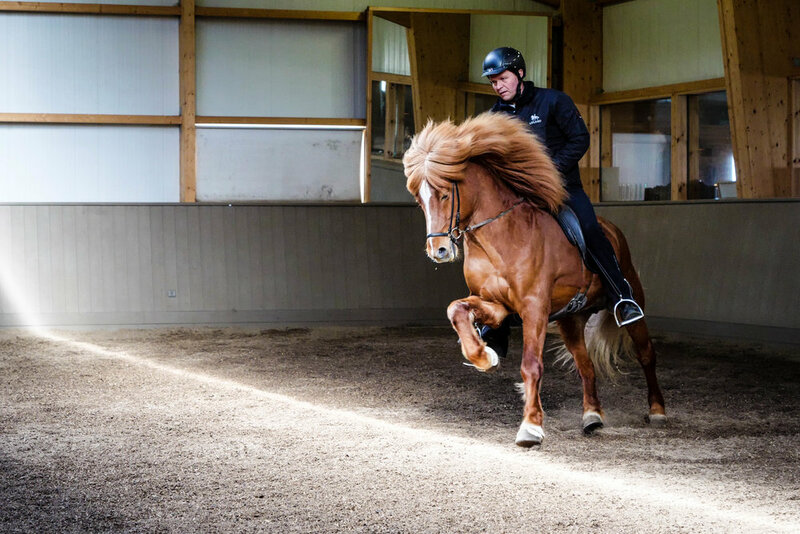 In addition to the breeding and training of horses, Svanhvít is a top competition rider and an appreciated instructor. With her extensive and long experience, she helps both rider and horse to reach their goals. Many of the top horses bred at the farm Halakoti are under under the two famous mares Glóð frá Grjóteyri and Oddrún frá Halakoti. Glóð is mother to Glóðafeykir, Glódis, Glóey och Glóinn fra Halakoti. Alfarún is the offspring of Oddrún and the famous stallion Oddur frá Selfossi with ride ability score 8,86 year 1994. Oddur frá Selfoss who received the honorprice for offspring in 2002 has given important contributions to Halakots bloodlines. One of our most famous stallions Glóðafeykir frá Halakoti, was bred and trained by us and won B-flokk at Landsmot with his best friend Einar Öder Magnusson in 2012." 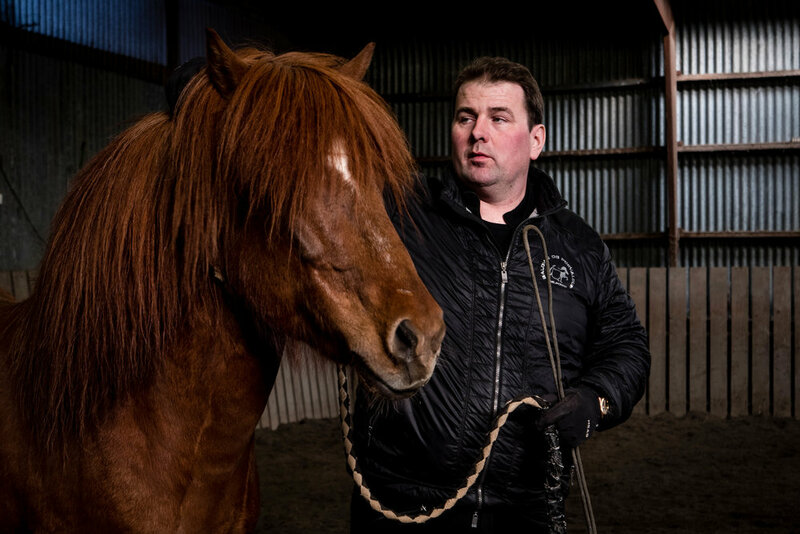 Sunnuhvoll is the small family breeding that grew into being a family business with breeding, training and teaching Icelandic horses. At Sunnuhvoll they are a family of six: The parents Siggi and Anna and the kids Arnar, Glódís and Védís - and Arnar's girlfriend Árný. 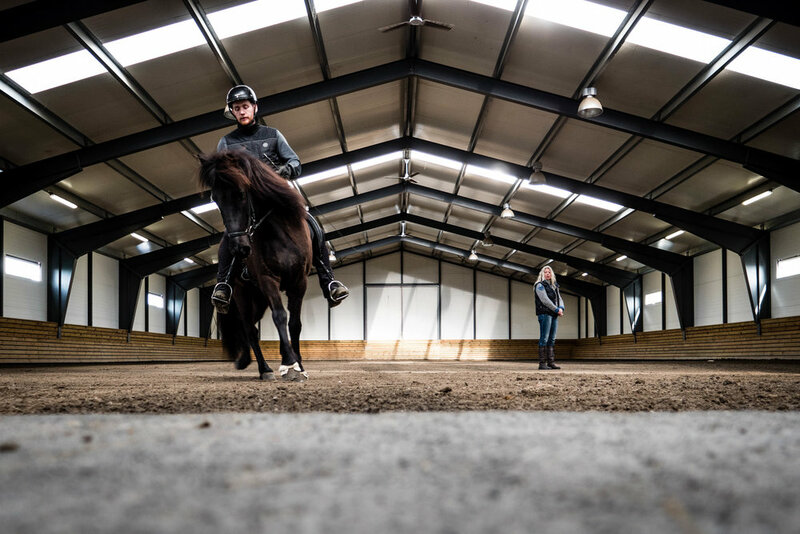 The family has lived at Sunnuhvoll for a little more than 20 years and just last year they built a new stable with a 20x40 riding hall and 32 boxes. Sunnuhvoll is located about 5 km west from Selfoss. “You can say that this breeding started about 30 years ago when Anna got the mare Saga frá Litlu-Sandvík. She has had 17 offsprings that are the foundation in the breeding. Especially her daughter Urður frá Sunnuhvoli which gave horses like Tjörvi frá Sunnuhvoli, Nordic champion in tölt and the father of the World Champion Desert frá Litlalandi, and silver medalist Röskur frá Skjød. Our breeding goal is to breed soft supple gaits with elegance and a good character. We believe in quality over quantity and for a long time the breeding was only 2 mares but now has increased to 8, so we expect somewhere around 6-8 foals each year the next couple of years. The bloodlines in our foals come from many directions but we look for a good character, clear gaits and big movements and a supple topline.